Microsoft Insider team is now working on Windows 10 update build 14393.50 (10.0.14393.50). Most probably we will get this update with Windows 10 Anniversary Update tomorrow. 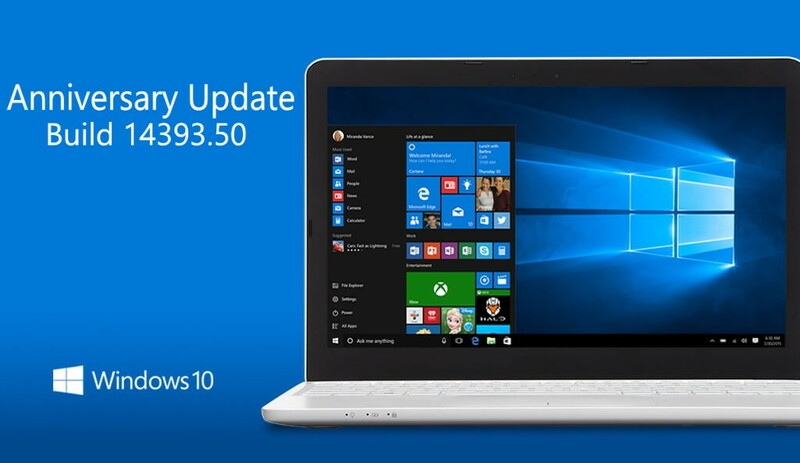 New leak shows that upcoming cumulative update or PC build 14393.50 and Mobile build 10.0.14393.50 is compiled on June 29, 2016. Previously insider team was testing update build 14393.33 as we reported earlier. This upcoming cumulative update for PC and Mobile could be a Zero-Day patch as we have no time left for Anniversary Update release. There is still no news of Windows 10 Anniversary Update Build 14393 ISO. But we can expect Anniversary Update ISO coming today or tomorrow. You can download previously released two Cumulative Updates KB3176925(build 14393.3) and KB3176927(build 14393.5) for Windows 10 Anniversary Update. Both updates available for PC and Mobile insiders. Cumulative Update KB3176927(build 14393.5) is now also available for Slow ring insiders. Microsoft released XBox One Summer Update ahead of Anniversary Update with the host of many new features. Check what’s new in Xbox One Summer Update. Microsoft is releasing its Windows 10 Anniversary Update tomorrow.